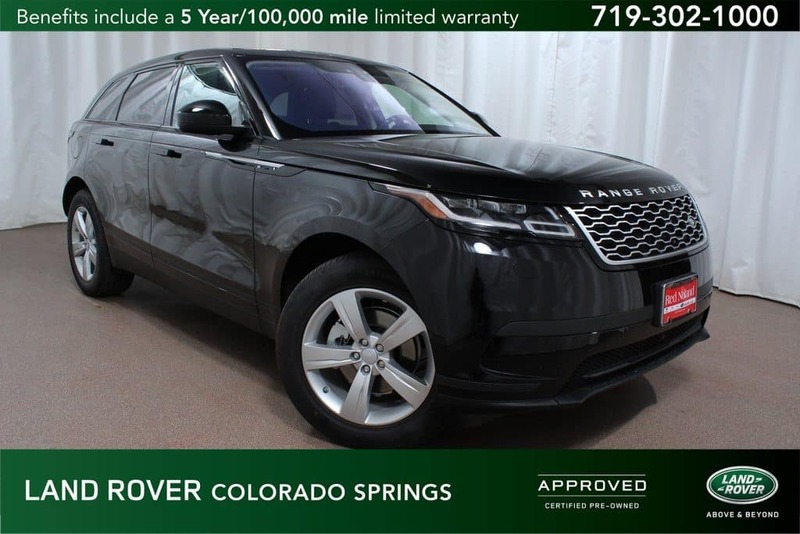 If you are searching for a Approved Certified PreOwned luxury SUV, you will certainly be able to find what you are looking for here at Land Rover Colorado Springs! We will happily help you into a new-to-you Land Rover that we have fully inspected, plus give you a great price to boot. Our current inventory does include this 2018 Range Rover Velar. Our original MSRP for this model is $62,169, but you can get it for the Red Noland price of $55,489 when you lock in the price and confirm the availability today! This gently used CPO 2018 Range Rover Velar is a great mix of luxury, comfort, efficiency, and advanced technology features. This specific model has a Narvik Black exterior color and is complimented with a luxurious Ebony Black interior. It is equipped with a 2.0L turbocharged engine and paired with an 8-speed automatic transmission, which will get you an estimated 26 MPG city/30 MPG highway fuel economy, which is fantastic especially for an SUV of this size! We promise that this Velar will also wow you with its long list of premium features including traffic sign recognition, Apple Carplay, Touch Pro navigation system, and SiriusXM satellite radio. This Velar also has heated steering wheel, power sunroof, and heated windshield. Plus, being an Approved Certified PreOwned vehicle, you will be backed by our CPO warranty of 5-years or 100,000-miles. So, if it’s time to treat yourself to a new SUV, at Land Rover Colorado Springs we know how to work with your wants, needs, and budget. You can give us a call at 719-302-1000 if you have any further questions about this 2018 Range Rover Velar in particular. Or visit us to take a test drive and experience the impressive performance of this Velar.